In the celebration of Yoko Ono: One Woman Show, 1960-1971 at the Museum of Modern Art, curated by Christophe Cherix, head of drawings and prints at the museum; and Klaus Biesenbach, the museum’s chief curator at large, Fluxus Foundation is pleased to present a digital archive featuring foundation’s curatorial efforts that has been devoted to Yoko Ono, together with other Fluxus artists led by George Maciunas whose goal were ‘social not aesthetic’, hoping to bring the sensibilities of artistic life into the everyday. We used to walk around the city. It was warm and rather quiet. Most people on the Upper East Side probably went to the Hamptons or something. We felt good, like we owned the city. Both of us were totally bigheaded people. So, yes, we were the owners of something. Maybe not the city, but something…maybe not tangible… As they say, those were the days. — Yoko, April 08. Highlighted in this archive includes Yoko Ono’s magnum opus – Grapefruit (1964), which is not only a seminal Fluxus work but also the crown jewel of Conceptualism. The research and exhibitions about Grapefruit at the foundation, on the one hand, contextualized this work in a broader framework of Event Scores pioneered by George Brecht among others; and on the other, distinguished Yoko’s work by its greater spirituality beyond mere conceptualism. Curated by the current Fluxus Foundation Chairman Harry Stendhal, the original manuscript of Grapefruit was for the first time exhibited as a complete set, unfolding in an impressive grid at Stendhal Gallery in 2009. A lesser-known work is Grapefruit No.2 – ‘over 200 compositions in Music , Painting, Event, Poetry and Object (including TOUCH POEM) to be published in 1966’, yet never produced. D.I.Y. Do-It-Yourself is a group exhibition that examined how the Fluxus movement applied the DIY philosophy to practice establishing an interdisciplinary, anti-art approach directed towards bridging the gap between artist community and society. Included in the show was Do It Yourself Fluxfest (1966), a 20-piece collection conjoining short instructional texts by Ono with Maciunas’ humorous graphic illustrations. Not unlike Grapefruit, this work affirms the performativity of Yoko’s imagination. What’s different is that the interpersonal exchanges she created with her solitude of self and with audiences, if there is any, are extended in length through her 20-day instructions.The exhibition was accompanied with an essay by Fluxus artist and scholar Ken Fridman. In a broader context, Friedman discussed the challenges of doing it yourself in the poetic economy, and raised the question: what can we do to shape a world that has room for the do-it-yourself ethos? Famously interdisciplinary, Fluxus’s anti-art also extended notably into the realm of film. Coined “anti-films,” Fluxfilms were radical interpretations of the medium, devoid of film’s traditional narrative and highly representational structure, where Yoko Ono performed a vital role. Yoko’s film No.1 (Fluxfilm No. 14) presents a lyrical, slow-motion-study of a burning match. George Brecht’s ENTRANCE to EXIT features entrance and exit door signs, fading through black and white. George Maciunas’ ARTYPE is a cameraless film featuring benday dots and line patterns. These anti-films are silent, black-and-white, and overturn traditional filmmaking by involving direct manipulation of film reels and developing processes. 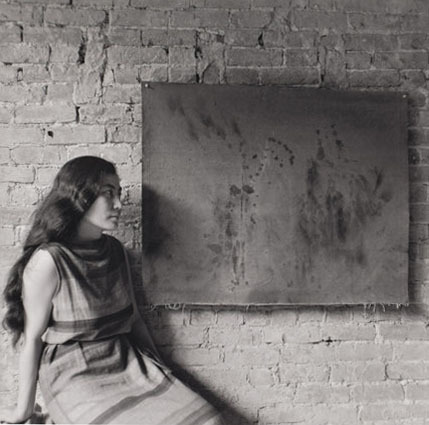 Fluxus Foundation Archive – Yoko Ono consists of curatorial statements, exhibition documents, reference materials and some scholarly essays originally commissioned by Fluxus Foundation.